We are in Lincoln for a hotel night with the Royuks, and when Beth and I walked downtown to get some goggles for her kids to use in the pool, we passed by a wonderfully long line of kids (and adults) waiting for the midnight showing of Harry Potter. Many were in full garb, and I have to say – it warms my heart to see geeks show devotion to something near and dear to them. Long, long ago a bunch of us sat in line all afternoon for Episode One of Star Wars. Hindsight tells us we didn’t need to, but it was fun all the same. By the way, Hilton Hotels, I am a little annoyed at your lack of honest, free wireless. As I sit here, late at night in an empty lobby, re-typing this entire post because the first, much-wittier draft is lost to the ether because the ‘free’ wireless in the room is about as strong as a one-winged butterfly, I am irritable. And sleepy. 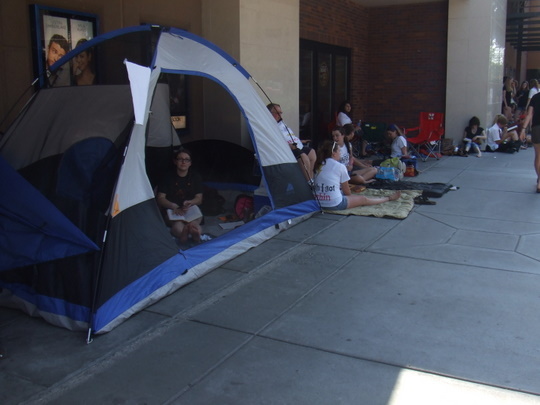 Awww, you lined up for Phantom Menace as well, God love you. The overwhelming memory of that night (aside from the stony silence as everyone left the screening) was that there was a massive smell of body odour. Doesn’t matter how awesome your Darth Maul costume is if your pits smell. “…the stony silence as everyone left the screening…” HAHAHA! Norfolk also had a midnight showing. One of the girls in line was interviewed on the radio. She has read the entire series multiple times and book 7 at least 10 times. To quote her: I don’t want it to end!!! Hehe…I like the guy in the tent. I wonder how long he’s been there. 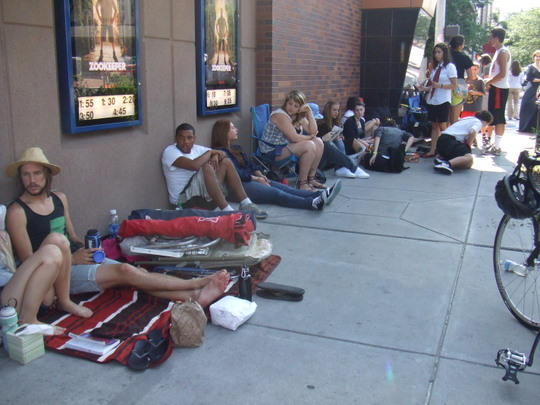 I have to say that I’ve never waited in a line like that for a movie. The longest I ever waited is probably 20-30 minutes, only once or twice. I don’t care for lines …. anywhere. OK, I guess I don’t get it……we went to see the midnight showing for the final (I guess it was episode 3) of Starwars and the first part of episode 7 of Harry Potter, and I don’t remember having to wait in a long line for either. PS…Are you planning to catch a Harry Potter matinee while you’re in Lincoln today? We also braved the line for the premiers of all three Lord of the Rings movies. That was harder, because they came out on December 17, 18 & 19 --Lauren’s birthday, The Day Between our Birthdays & my birthday. Those lines were quite cold, but we had huge coats that help half a candy store full of candy. We just send the bags/boxes of candy down the row. Opening Nights can well worth the lines. Went with a group of 9 last night to a double feature of Deathly Hallows part one at 9pm followed by part two at 12am. For the bargain price of 20 bucks, we got to walk right past the less-clever folks camped outside and wait for part two in the comfort of an air-conditioned theater while watching part one! I’m sorry I missed the costumes. I need to get an outfit like Dumbledore and wear it on the first day of school. Wouldn’t that be awesome?!? Except for the mask, it’s a homemade outfit. I guess it’s really true…if you keep something long enough, it comes back in style. …oops, I meant to ‘strike’ thru Halloween. You can fix it if you’d like.